After the spectacular day of safari yesterday, we weren’t sure day two could compare. I mean, we saw two of the Big Five (Lion and elephant, still “missing” the leopard, rhino and buffalo) and a bunch of other cool animals in one day, that’s pretty good. We awoke to room service bringing coffee to our tent, a service we both thought we could quickly get used to, then loaded into the Land Rover for the prebreakfast game drive. As we rolled out of camp, we saw the elephants that were familiar enough by now that we were learning their names, then off to look for a leopard… and other stuff… but mostly the leopard. Within the first mile of the drive, our guide spotted lion prints on the dirt road, so we followed them. The lion was thoughtful enough to stay on the road and in ten minutes, we caught up with her. It was likely the same one we saw yesterday, but seeing any big cat is awesome, so we sat and watched her for a few minutes, then left her in peace. With everything happening on the drive yesterday, I had placed my sunglasses on the seat when I stood to take a picture and forgotten about then until after they fell out of the car. I knew it was a long shot but I mentioned it to Anthony, our driver, as we set off, hoping we might see them. Once we left the lioness, we restarted our search for the leopard. Everyone was looking in different directions and occasionally we would stop so the driver could pull out binoculars and search the distant hillside. Minutes of searching seemed to take ages with anticipation. Then we stopped and reversed a few feet to see around a tree. Everyone turned to scan the area behind the tree and the driver got out of the car. This does not happen. Signs everywhere and the welcome briefing all emphasize the importance of staying in the car. What was happening? Anthony walked to the front of the car, bent over and picked up my sunglasses. So much squinting for cats, I had forgotten that I dropped them. They were a little worse for wear, an elephant had stepped on them and cracked one lens, but still useable, so I put them back on and we continued our drive. Two hours of driving later and we still hasn’t seen a leopard. By now, we were all getting hungry for breakfast so we headed back to camp. On the way we saw a flock (although that feels like the wrong term) of ostriches running across the field. They are impressively fast. The afternoon drive started with more elephants, but not the ones we were used to. Instead a family was crossing the river. It was fascinating to watch how two or three would surround the smallest one and push it. The baby was too small to forge the river on its own, but managed to keep enough of its head above water to get air while it was buffeted across. 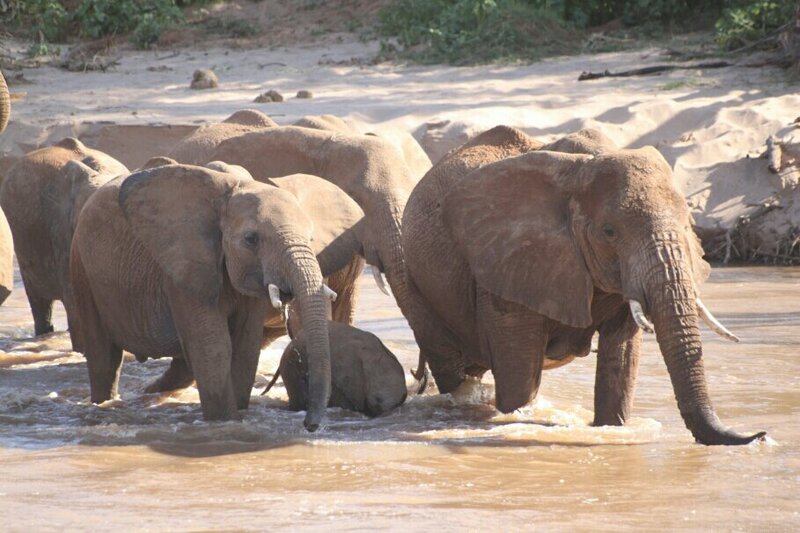 Then teenage elephants got no such help, but they splashed and played it the water for a long time. At one point, there were three elephants in the deepest part of the river and all that was visible besides the churning water, was one trunk periscoping up from the murky abyss. 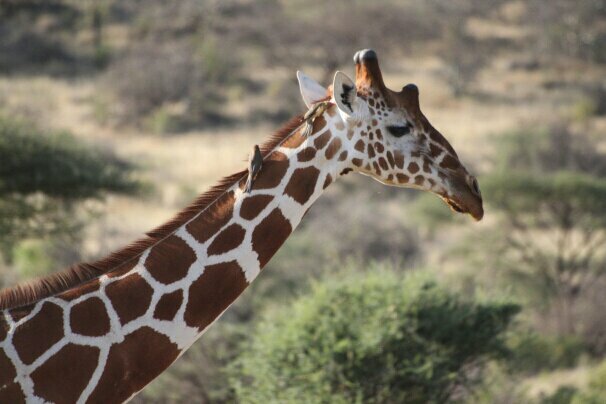 We continued driving and came across a giraffe. We drove for another hour seeing only birds. We came across another car and asked if they had seen any cats, but no luck. I resigned myself to not seeing a leopard and tried to enjoy the bird life that enthralled me only one day before. The a phone rang. It was another guiding service and they just spotted a leopard by the river. Apparently, this is how it is done now. We weren’t you far away, so we drove over hoping to catch a glimpse. By the time we arrived, it had ducked into a bush and they had lost sight of it. We drive around to the outside and started looking. Dom spotted it first, hidden in the underbrush. We all got a chance to see it. As the other car pulled around, the leopard got nervous and ran which was cool to see as well. Such graceful creatures. In less than two minutes, the last hour of aimless driving was redeemed. 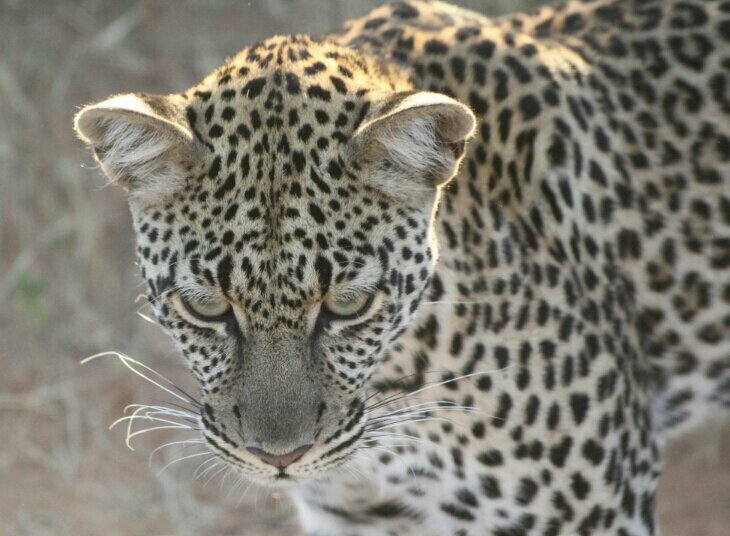 Three of the four passengers in our car were elated to have seen the leopard. The fourth, a thirteen year old, girl was disappointed that she didn’t get a picture before it vanished. I offered to give her a copy of mine, but that wasn’t the same. As we made our way back towards camp, we noticed a collection of parked cars on the other side of a gully. 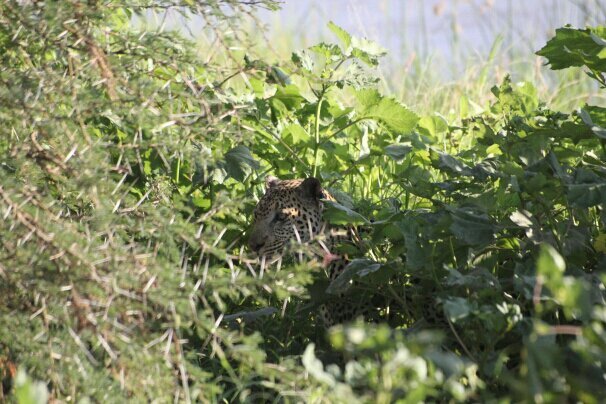 A quick phone call told us there was another leopard. We had to take the long way around, but it didn’t matter. This leopard was still young and bold. She didn’t care that people were watching her. When we arrived, she walked directly towards our car and this time, we all got wonderful photos. We ended the day with drinks and a fire on the (elevated) back of the river at sunset. Having watched two crocodiles share a meal in the river earlier, the 15′ high back was close enough to the water. As the sliver of a moon appeared just as the sun dropped, we agreed it was the perfect ending to an amazing time spent in Samburu. Your pictures are wonderful and your descriptions exciting. This is very entertaining reading. Glad you’re having such wonderful adventures. Can’t wait to hear more about them when we see you next.